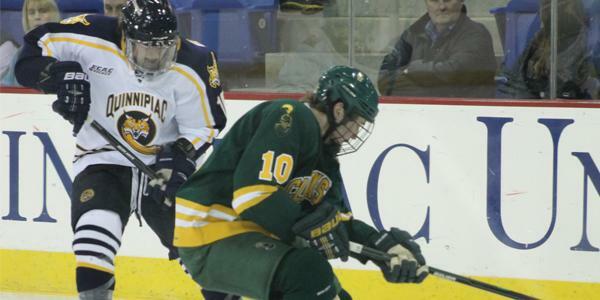 All posts tagged "scott zurevinski"
Aggression was flowing Tuesday at the High Point Solutions Arena at TD Bank Sports Center as Quinnipiac rolled over Bentley, 6-1. Cornell’s senior recorded his second two-goal night against the Bobcats this year, and shut the door on Quinnipiac’s season with a game- and series-winner in overtime on Sunday at Lynah Rink in Ithaca, N.Y.
A late second-period goal from Joe Devin, his second of the game, lifted Cornell to a 2-1 win in a best-of-three series at Lynah Rink in Ithaca, N.Y. The Bobcats missed an opportunity to move into seventh place in the ECAC and get closer to home ice in the first round of the playoffs. Quinnipiac sophomore goaltender Eric Hartzell was zoned in Friday night, stopping a career-high 31 shots and picking up his second career shutout in a 2-0 win over Dartmouth at the TD Bank Sports Center. The Quinnipiac men’s ice hockey team scored three unanswered goals to defeat Colgate, 3-1, Saturday night at Starr Rink for its first Eastern College Athletic Conference Hockey victory. 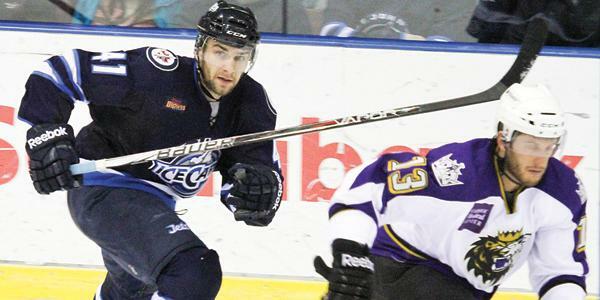 For college students, summer vacation is a temporary break from school, but for men’s ice hockey junior foward Scott Zurevinski, he didn’t know whether to make his vacation from school a permanent one.